Neil Young's "Honor The Treaties" Canadian benefit trek kicked off Sunday night at Toronto's sold-out Massey Hall. As as he did earlier that day, Young didn't mince words when it came to the plight the Athabasca Chipewyan First Nation face regarding the ongoing oilsands development. Near the homestretch of his set, Young -- who was a bit more tight-lipped from start to finish -- reworked the closing lyrics to “Pocahontas,” referring to how Young and Pocahontas would love to meet Harper in Ottawa for having broken the treaties. Young hit a nerve with the crowd, resulting in a raucous, standing ovation. The reference seemed to be regarding American politics and in particular, the former George W. Bush administration which he spoke about Sunday afternoon. He also earned applause for referring to the hallowed venue and development plans to modernize the facility over the coming years. “Don't let them change this place,” Young said as he sauntered around the stage that's hosted to some of his most iconic concerts. But to steal a few lines from his opening song “From Hank To Hendrix,” Young primarily shone with his old guitar (or pianos) by simply doing what he's done for over four decades. 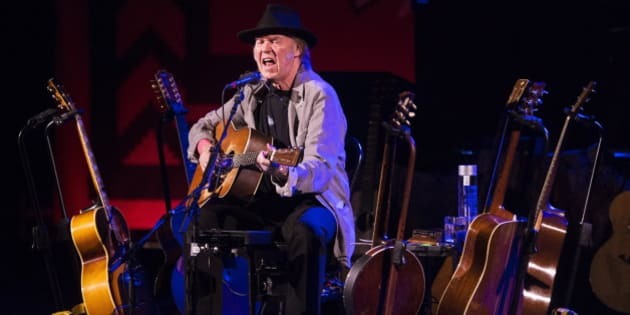 Although there were a few shouts for requests, he obliged one fan for cover of Bert Jansch's “Needle Of Death,” a song he covered during his recent New York City stint. He also cracked a grin after earlier stating he only had one hit and a fan yelled “Play your hit!” And Young delivered with many singing along to "Heart of Gold". Other highlights included a spine-tingling “Helpless” which would make k.d. lang jealous, a passionate rendition of “Ohio” and “A Man Needs A Maid” that had an almost hymnal flair to it.